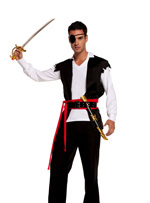 6 piece Pirate costume includes bandana, eye patch, shirt, vest, sword and boot covers. Check out the size of that sword 5 piece costume includes eye patch, vest, long sleeve shirt, belt and sash. She'll surrender the booty in this 4 piece costume that includes off the shoulder top, skirt, sash and hat. She's searching for booty in this 4 piece costume that includes vest, capri's, belt and arm bands. This ruthless babe goes stright for the gold 6 piece costume includes head scarf, eye patch, crop top, gaucho pants, arm bands and dagger. 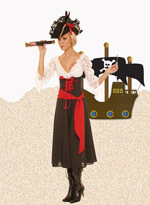 She's pointed toward the deserted island 4 piece costume includes long sleeve dress with lace sleeves and lace up bodice, scarf, telescope and hat. This playfull pirate is queen of the high seas in this 3 piece costume that includes hat, lace dress with attached coat and telescope. Shown with hosiery #1733.